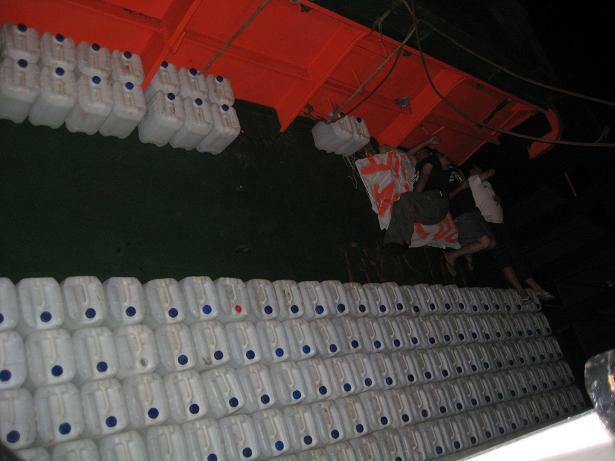 The following text recounts how the Gaza siege was almost broken by a lone humanitarian ship. What the Spirit of Rachel Corrie achieved, its crew and passengers, constitutes an outstanding act of courage and determination, taking the Israeli Navy totally by surprise. Global Research’s Julie Lévesque participated in this mission to Gaza organized by the Perdana Global Peace Foundation (PGPF). This is her vivid account of the Spirit of Rachel Corrie mission, pertaining to the day by day life on the ship, recounting in detail the actions of those who, acting in solidarity with Palestine, put their life in danger with a view to breaking the illegal Israeli siege of Gaza. The idea of sending flotillas to Gaza originally came from former Malaysian Prime Minister and Perdana Global Peace Foundation’s (PGPF) founder Tun Dr. Mahathir Mohamad. For decades now he has been a very outspoken advocate of the rights of the Palestinians. Like most people who take a firm a stand against the illegal actions of the state of Israel, he was labelled “anti-Semitic”. This type of ad hominem attack is the only stratagem left for those who wish to defend an illegal and immoral occupation. PGPF’s goal is to make war a crime. “We can not allow people to kill and glorify killing. We need to change the mindset and reject war as a means of settling disputes. This is the beginning of a very long saga which will take many years,” explained Tun Mahathir. 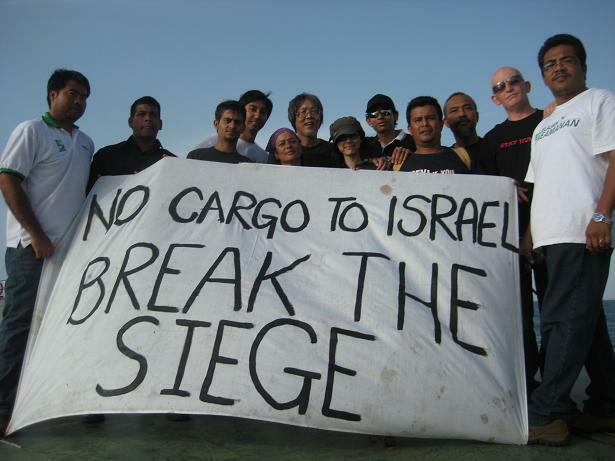 In 2010, PGPF joined the Freedom Flotilla with the “Rachel Corrie”. This year it decided to act alone and send its ship, the “Spirit of Rachel Corrie” (SRC), ahead of the Freedom Flotilla II. The mission’s ultimate goal was to “bring liberty in Gaza” and “prove to the world that Israel has no right to impose this illegal siege”, Mahathir told the participants of the mission about to set sail on the SRC. In the light of the recent failed attempt of the Freedom Flottilla II, the SRC mission can be considered a success: it is the only ship this year to have entered Palestinan waters. Its modus operandi should serve as an example for future attempts to break the illegal siege of Gaza. 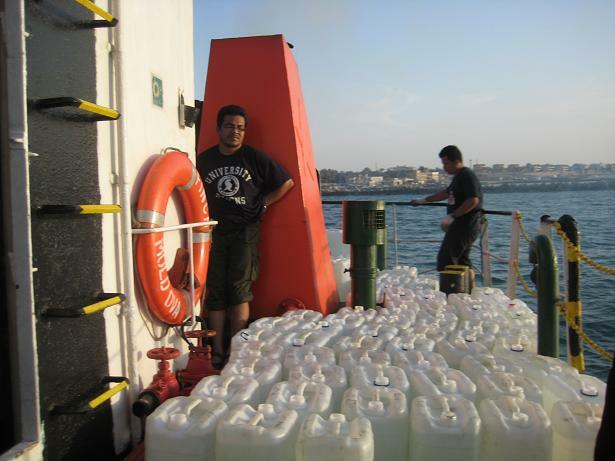 May 11, 2011, a ship registered as the MV Finch flying the Moldovan flag left the Greek port of Piraeus unnoticed. 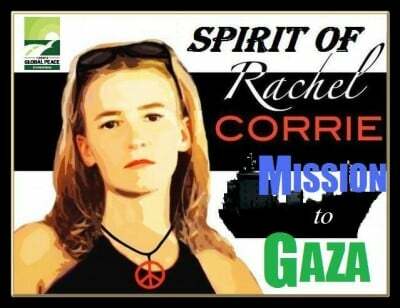 It was the Spirit of Rachel Corrie Mission (SRC). 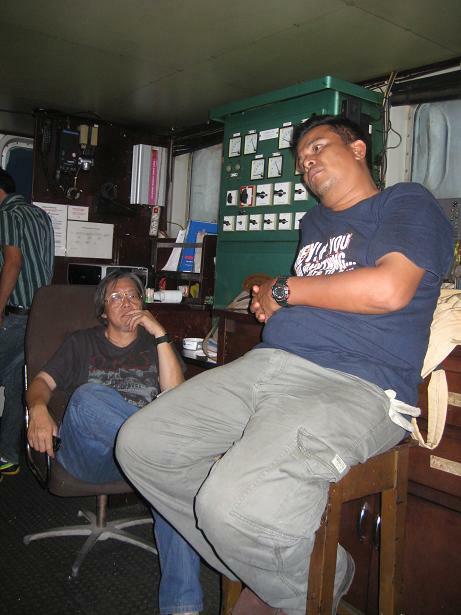 On board were 12 crew members and passengers: 7 Malaysians, 2 Indians, 2 Irish and 1 Canadian. Fearing that they would be prevented to sail to their destination, the organizers of the mission opted for a low profile rather than a big media campaign. They neither disclosed where they were leaving from, nor where they were going to. It turned out to be a good idea. Unlike the Freedom Flotilla II which was supposed to sail to Gaza, they were able to leave the Greek port of Piraeus without any form of encroachment and sail towards Palestine. Had the Greek authorities known of the Spirit of Rachel Corrie’s (SRC) ultimate destination, they would have prevented it from leaving Greek waters, as they did with this year’s “Freedom Flotilla”. May 16, 6am. Sailing out of Egyptian waters five days later, the SRC entered Palestinian waters undetected, to the great surprise of Palestinian fishermen, dazed at the view of foreign passengers on a ship waving and smiling at them. Boats try to break the siege regularly. Not ships. “Palestine! Palestine!”, they yelled with astonishment pointing at the water, probably thinking the captain was lost. Since everyone was soon expecting an encounter with the Israeli Navy, that moment lightened the atmosphere on the ship. But not for long. The ship continued its course until the passengers and crew saw two speed boats from the Israeli Navy coming towards the ship. “They’re coming”, said Jenny Graham, the Irish activist. She started making a call with a satellite phone when the first machine gun shots were fired. Half of the passengers ran for cover in an enclosed area on the deck. Other passengers and crew members went inside on the bridge. The Israeli navy contacted the captain, Abd Jalil bin Mansor, who explained the ship was delivering humanitarian aid to Gaza and that there were no weapons on board. He was asked to turn around. He refused. Captain Jalil Mansor explaining the route chosen to penetrate Palestinian waters. Meanwhile, three rounds of shots were fired. “Welcome to my world”, said Jenny, stoic, to the people lying down beside her on the deck. From there, no one could see where the “warning shots” were going or where they were coming from. Every once in a while we could get a glimpse of the boats circling the ship. One of the passengers was praying, the other one had his hands up to show he had no weapons, although we were the only ones who could see him. Derek Graham had been through this before. He was outside smoking a cigarette, looking straight at the man behind the machine gun with his arms wide open, inviting him to shoot. Seeing him, Alang Bendahara, reporter for the News Straits Time stood up on the deck to get some footage of the boats shooting. The captain obeyed. The ship changed its course. Another round of shots was fired even though the captain had followed the navy’s orders. Then the Egyptian navy, which never noticed the ship entering and leaving their waters, responded to repeated calls from the Israeli navy and asked them to stop shooting. They did. As the ship was escorted back in Egyptian waters, the Israelis thanked the Egyptians for their cooperation on the siege and went on firing at the tiny and vulnerable fishing boats. The SRC was kept in the waiting area of El-Arish Port in Egypt for seven weeks. 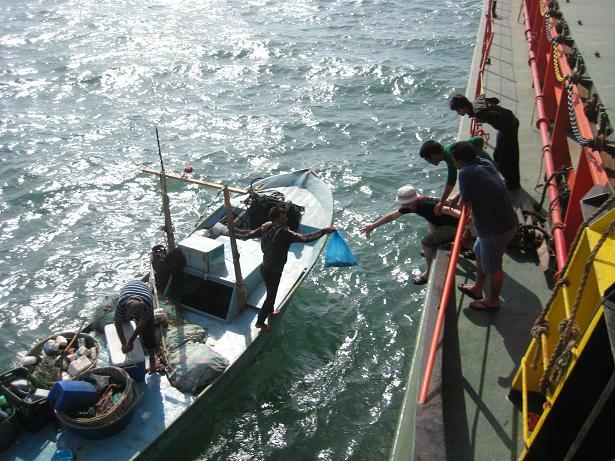 The ship tried to head back to Gaza through Egyptian waters a week after its first attempt. As it was escorted out of Egyptian waters by the Egyptian Navy, which had ordered the captain to head to international waters, the ship experienced technical difficulties and was escorted back in the waiting area in El-Arish. A few days later, fishermen were allowed to come near the MV Finch and sell fresh fish. 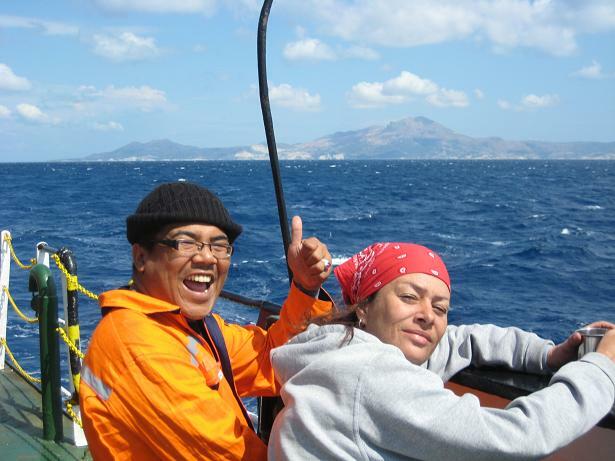 Apart from the two Irish activists and Matthias Chang, no one else on the ship had engaged in such an adventure before. 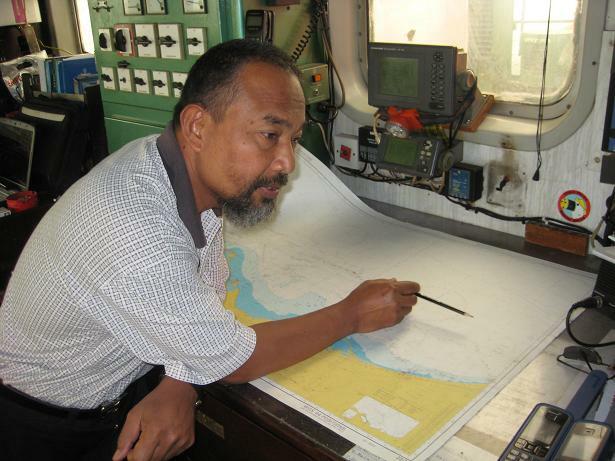 Chief engineer Zainuddin Mohamed’s reason for accepting to go on this mission was simple: “I wanted to see for my own eyes what is going on there.” Captain Jalil Mansor aknowledged: “I have come to a point in my career where I needed a challenge.” Since he had military training in the past, the captain was not intimidated by the Israeli navy’s gunfire and rather “enjoyed” his confrontation with them. Although they were not taken to jail, people on board the Finch were, in a sense, imprisoned on the ship. They were not told why they were being prevented from leaving the ship and were promised countless times that they would be allowed to dock the next day. The Canadian embassy in Egypt confirmed that the matter was in the hands of military intelligence and that the Egyptian Ministery of Foreign Affairs was not the one handling the issue. The people on board showed tremendous solidarity for several days by refusing to leave in small groups: it was all or nothing. promises, almost two weeks after entering Palestinian waters. had never experienced that before. The original crew members and passengers were finally all allowed to leave the ship on June 3, 18 days after they entered Palsetinian waters. Three of the Malaysians had decided to leave on May 31. The new crew was kept in Egyptian waters for another month. On July 6, the cargo was unloaded and delivered to Gaza shortly after, on July 12. The cargo, however, was not delivered to Gaza through the Rafah crossing. The cargo was brought through Karem Shalom, into Israel. Since May 28, the Rafah crossing was supposed to have been opened for people and humanitarian aid, according to statements of the Egyptian government. This did not happen. The Egyptian authorities refused to let the PGPF’s humanitarian cargo go through Rafah, even though it was humanitarian aid: UPVC pipes to restore the sewage system in Gaza, where a water crisis is raging and which affects not only Gazans, but neighbouring countries including Israel and Egypt. The destruction of the sewage system in Gaza by the Israeli army has led to 50 to 80 million liters of raw sewage being released in the Mediterranean daily. The SRC cargo was instead delivered through Karem Shalom, in Israel. The cargo was considered as reconstruction material, which Israel requires to be delivered through its illegal checkpoints. While they were on the ship, the original 12 passengers and crew members were given that option and had refused categorically that the cargo be transferred through Karem Shalom, or any other Israeli checkpoint. Jalil Mansor, Derek Graham, Radzillah Abdulla. The refusal of the Egyptian authorities to allow for the shipment of the humanitarian cargo through Rafah suggests that the interim military government is taking its orders from Tel Aviv and Washington. While the SRC was stranded in Egyptian waters, the crew and passengers on board were told that the ship would not allowed to dock for “security reasons”. The matter was in the hands of Military Intelligence. Military Intelligence is attached to the Ministry of Defense headed by Mohamed Hussein Tantawi Soliman who is the commander-in-chief of the Egyptian Armed Forces and de facto head of State. The outcome of the SRC mission indicates that the post-Mubarak Egyptian government, rather than taking a “strong stance against Israel”, is still working hand in glove with Israel and the US. The Egyptian people however, from navy personnel to fishermen, have demonstrated strong support for the Malaysian mission to Gaza. Once again, a UN committee denounces Israel’s illegal actions. Over the years though, these accusations have proven to be useless because only the Security Council can impose sanctions on Israel and it never has. In fact quite the opposite: Israel’s illegal actions have been protected on numerous occasions by a US veto on UN Security Council Resolutions critical of Israel. Even though they are labelled by Western governments and the UN as “useless”, humanitarian aid convoys, flotillas and lone attempts to break the siege have had a tangible impact on the lives of Gazans. The sewage pipes brought by the Spirit of Rachel Corrie are now in Gaza, which is facing a major water crisis. Physicians for Human Rights Israel issued a report in 2010 entitled: “Humanitarian Minimum: Israel’s Role in Creating Food and Water Insecurity in Gaza”. It addresses the impact of the Israeli blockade on public health in the Gaza Strip. 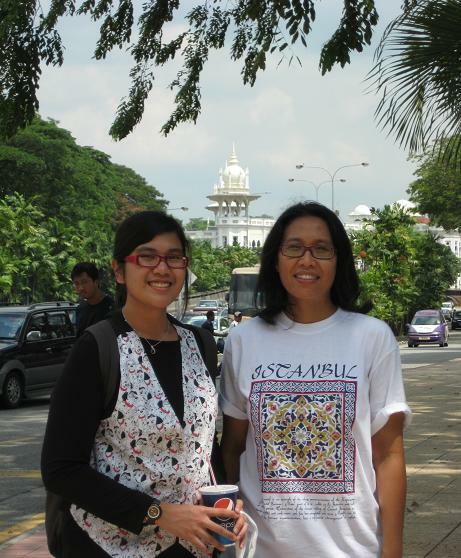 PGPF employees Farlina Said and Maizatul Akmar Mohd Naim in Kuala Lumpur, Malaysia. organization, and Jenny Graham shortly after leaving Greece. So far this year, the lone ship Spirit of Rachel Corrie was the only ship to enter Palestinian waters and “put a hole” in the blockade. Although it did not break the siege, it should be considered as a small victory against the illegal occupant, and its strategy should be taken into account by those who wish to break the siege in the future. 1- Favor a media blackout: To avoid being foiled, any attempt to break the siege should be concealed. The media should be alerted only when the goal has been reached or when the vessel has been prevented from reaching it. Big media campaigns may have the advantage of shedding the light on the illegal siege, they also reveal information which hampers the endeavor and serves the illegal occupant. The ultimate goal of such undertakings should remain to break the siege, not publicize it. 2- Conceal the departure location: The country of departure should be disclosed only to those who need to know for logistic purposes. 3- Conceal the destination: The authorities of the country of departure should be given an alternative destination. 4- Use deception: The Malaysian SRC mission, or MV Finch, was flying the Moldovan flag. The Israelis must have been aware that PGPF was sending a ship to Gaza since it was announced by the Malaysian organization a few weeks before the mission was launched. Only the dates were kept secret. The Israelis were probably expecting a vessel flying the Malaysian flag. 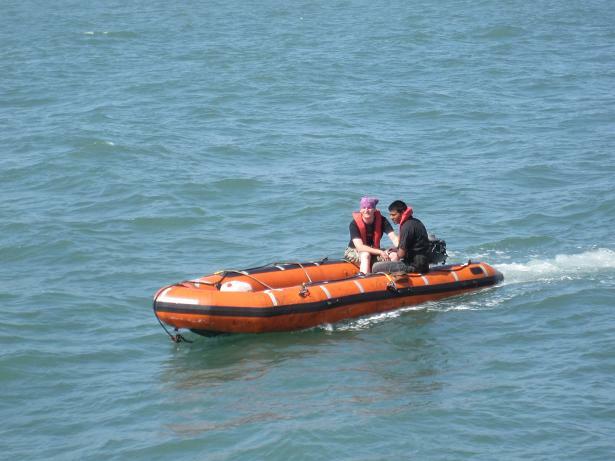 5- Get a fast boat or ship: The MV Finch could not go faster than 6 nautical miles an hour. Had it been faster, it could have reached the port of Gaza. 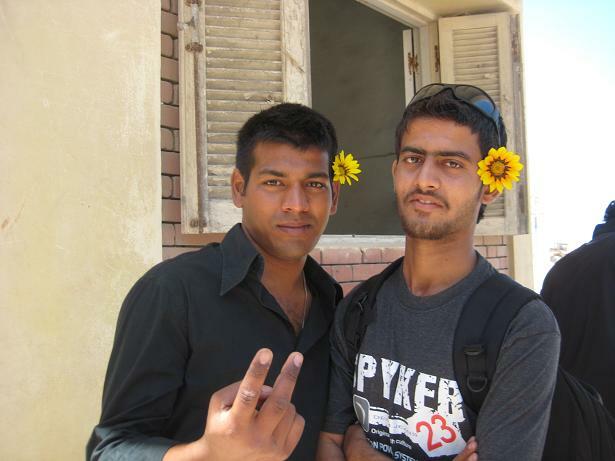 Satya Prakash and Chandan Sharma, the two Indian crew members. June 3, 2011 The last “ship prisoners” are released and join the land team in El-Arish.